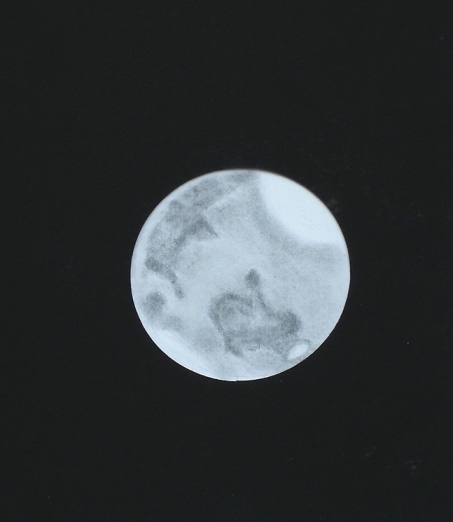 Conditions were poor to average for viewing and sketching Mars. Mars is now at 15″ of arc and 0.62 A.U. from us. 99.4% of the disk is illuminated and shining at visual magnitude -1.4. The central meridian of Mars was centered at about 41.87° at the beginning time of the sketch. Sinus Meridiani was visible near the limb on the preceding side. On this side clouds were visible over Eden. Mare Erythraeum, Margaritifer sinus and Aurorae sinus were all detectable to the south (up). Lighter Chryse could be seen at the equator with Niliacus Lacus, Mare Acidalium and Nilokeras blended together. Tharsis was under clouds on the following limb. The north polar cap is small in size and set apart by Mare Boreum. Very beautiful sketch! I have watched Mars some days ago and it was very intresting with Acidalium sea and others details! 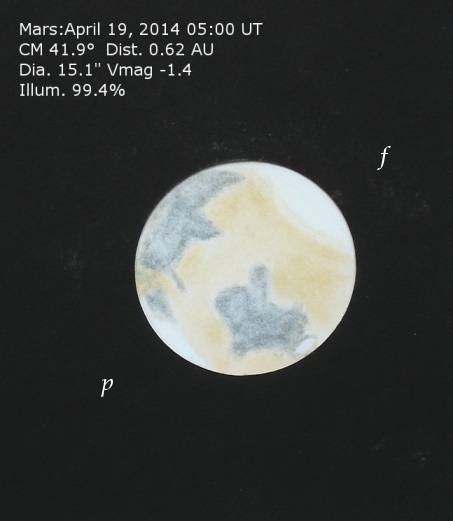 Frank, good very detailed drawing of Mars, plus excellent report on geographical location. Too nice, superb darwing Frank ! I have to buy this kind of filters, thank you for the idea ! Thank you all for the nice remarks. Very nice Frank, thanks for sharing this wonderful view of Mars!